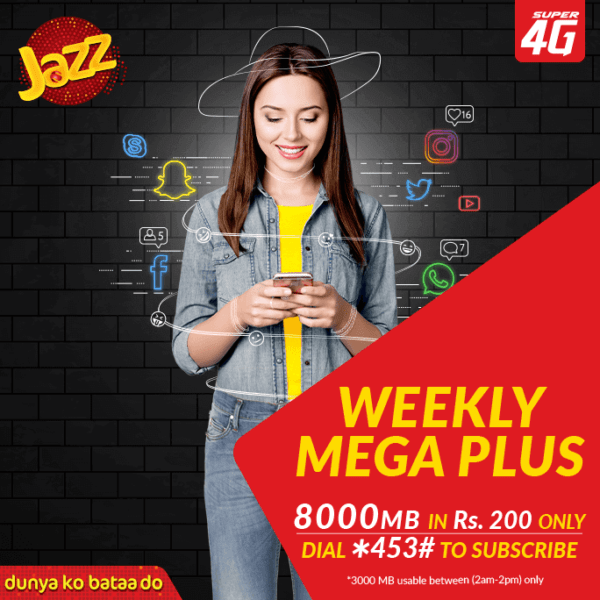 Jazz 4G presents an exciting internet package with very fast internet speed, named as Jazz Weekly Mega Plus Internet Bundle offer. With this internet bundle you can enjoy 8000 MB internet data and 3000 MB data can be used between 2:00 am to 2:00 pm with very high speed on and on up to 7 days. This offer is not applicable for the customers in Bajour, Mohmand, Khyber, Orakzai, Wazirstan, Kurram, Kalat and Kech (Turbat). The validity for this package is 7 days. You can subscribe and unsubscribe it daily by dialing *453#.